These burgers are very quick to make once you have the ingredients assembled. They can of course, be eaten at any time, but it’s a good idea to make up a batch and freeze them ready for when the sun comes out and you can whisk out the BBQ! They also cook well from frozen. 1/2 tsp marmite/vegemite/yeast extract stirred into 1 tbls boiling water. Mix the beans, nuts and Marmite mix in food processor. Mix in the herbs and seasoning and add a little water if necessary to make a moist mix. Let the mixture stand for around half an hour. 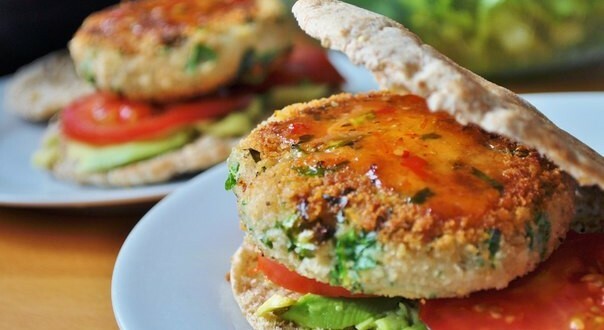 Shape into small burgers, dip in water and then dip into the nut flour. Fry the burgers in the hot oil. Anne O’Connell is a food and travel writer, author of Early Vegetarian Recipes and the blog Offmotorway She also runs Hollyfoods, a small food company selling locally at fairs around London. Next: 10 Easy Steps To Becoming A Vegan! If love to pin this recipie Please add pininterest!